In this Economy, Can your Company Afford to Pay You More? You know you deserve a raise. You researched the industry salary and benefits. You know colleagues are making more money than you. Regardless of this information you are concerned that the company cannot afford to pay you more. In this economy that is a concern many have. As a woman you are probably even more aware of this issue because women tend to be empathetic negotiators who worry about the other parties involved in the negotiation. With the knowledge that it’s a great time for companies, let’s see how to find out if your company can afford to pay you the market rate for the job you do. For women, this may mean a raise of 10%, 20%, 30% or more. There are a few ways to research the financials of your company. Public companies are easiest to research. Their financial information is public. You can typically find it on their own web site by searching the term “investor relations.” You can find it through the US Securities and Exchange Commission (SEC) filings. The SEC has a company search on their web site. You can find it on NASDAQ Company Financials if traded on NASDAQ. Other web sites with corporate financial information include Yahoo Finance and Google Finance. However you get to the financial reports there are only a few items that I recommend you review. Let’s use Apple as an example. 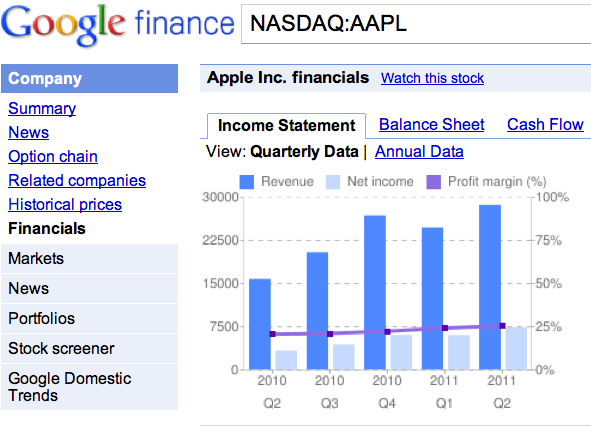 I pulled the Apple financial information from Google Finance. I like Google Finance because of their use of graphs but you may find another source preferable. As of June 25, 2011, Apple has over 12 Billion in Cash and Equivalents and had earned over $7Billion in that quarter. Both are improvements from the previous quarter. That took about five minutes to discover. I’m not suggesting every public company is in as good a shape as Apple but you will be able to find out. Not all companies are public. You may work for in the private company, public sector (government), or for a non-profit organization. Private companies are more difficult to discover but there are ways. First many private companies have company-wide meetings in which they share the overall financial shape of the company. Start paying attention if you haven’t paid close attention in the past. Often companies will create press releases when they close a big deal or hit a new milestone. Press Releases may include the expected value of the new client relationship. Such press releases will be posted to the company’s web site. The frequency of these releases can be one indication of financial strength. You may work for a public organization such as town, county, state, or federal government. For the most part their finances can be found on their own web sites. In some cases, you may find the water cooler just as or more informative. Often there is someone who is following all the ups and downs of the politics of funding. How will a new governor from a different party affect your department’s budget? Is there federal grant money that your department will receive? 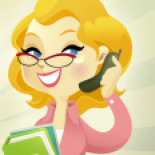 Right now it is hard to find governmental offices (local, state, or federal) that has extra money so this is the one market segment where you truly may have no option to negotiate additional money right now. Still have the conversation with management so you can be first in line when money begins to come into the public sector again. Non-profit organizations have to file financial reports as well. You can find copies of the 990 forms at Foundation Center. I looked up American Red Cross and was able to discover they started 2010 with $1.6 Billion in assets and ended the year with $1.9 Billion in assets. In the news is the fact that 97% of companies recently surveyed are planning for 3% increases in 2012 with top-performers expected to see a 4.8% rise in salary. You should be comfortable and confident about asking for more than a 3% raise armed with details about your company’s financial strength and the going rate for your job. This entry was posted on August 23, 2011 by Katie Donovan in Company Research, Equal Pay, Negotiating Tactics, Women Negotiating and tagged companies can afford raises, company finances, researching company finances, salary raises in 2012.